I really love avocados. They are creamy and delicious and with some imagination they are more than just guacamole base or a burger topping. 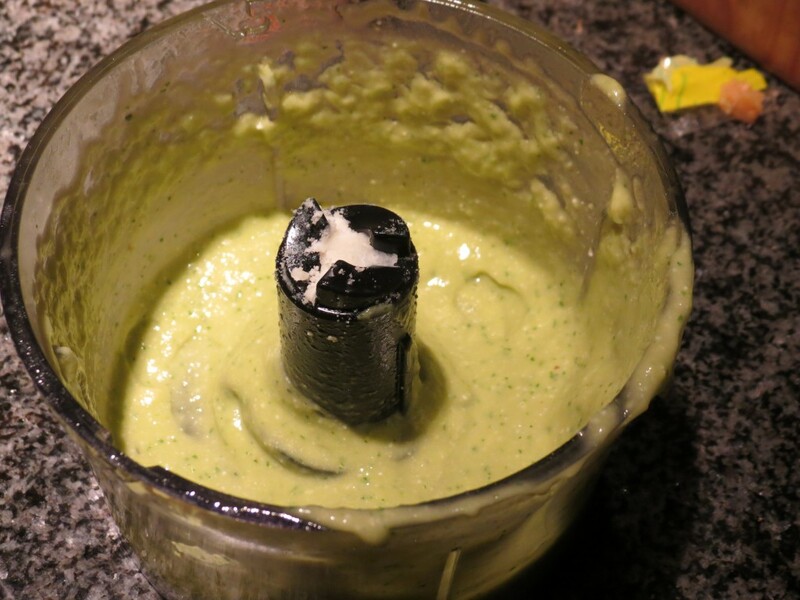 One favorite use is to create avocado mayo (mashed avocado + a bit of light mayo+ garlic salt). It’s a great spread for sandwiches, especially if you are making them the night before becuase the avocado doesn’t turn brown.Speaking of which, that’s the tough part about avocados… if you don’t use the whole thing, you have to get creative FAST or risk losing the other 1/2 to the trash. 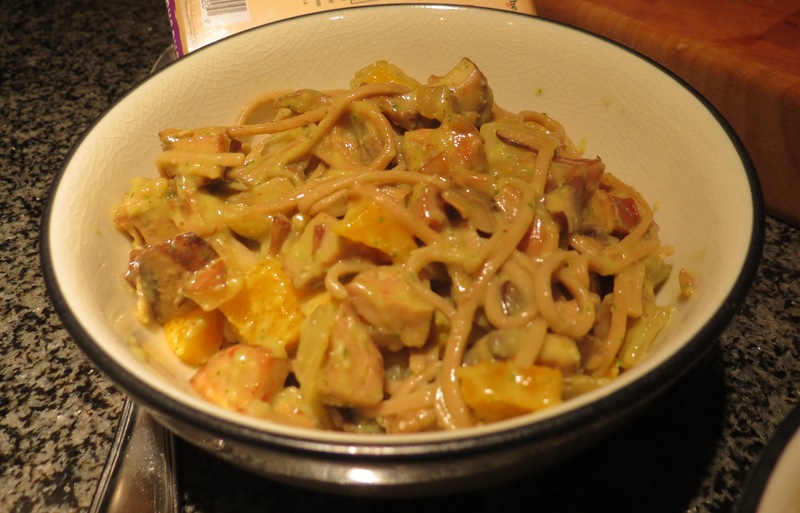 A few weeks ago I was browsing on pinterest and found a recipe for creamy avocado pasta sauce which intrigued me. Last night I decided to use that as a jumping off point for a new recipe and I was really impressed with the results. This is another quick and easy weeknight meal and as usual, there is a lot of room to play around according to your taste and what’s in your fridge! 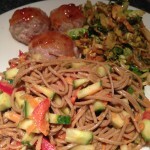 For starters, I used soba noodles as the pasta in this dish, but you could easily use whatever pasta you have on hand. 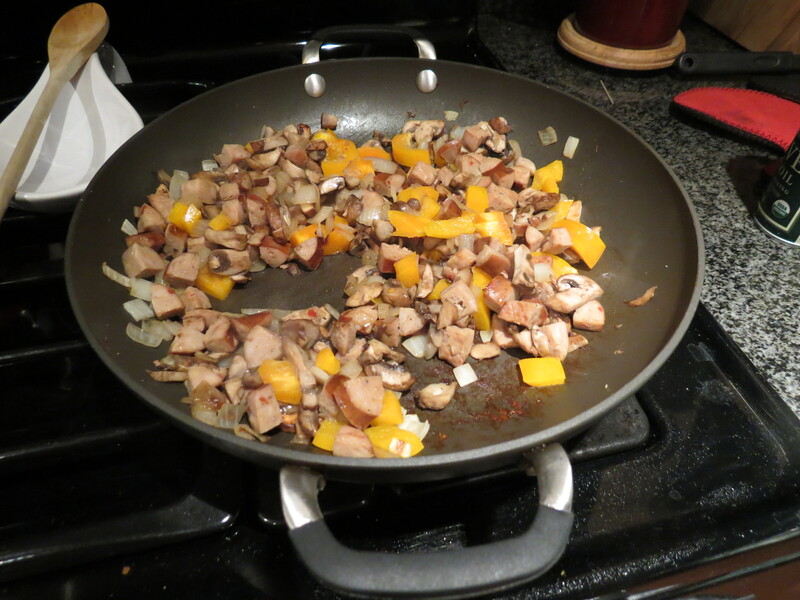 To start the dish I did what I always do when it comes to pasta… decide which vegetables are going to bulk it out. It’s so incredible to me how far you can stretch 1 serving of pasta when you add vegetables to it. You end up with a GIANT portion and you feel indulgent because you had pasta, but also amazing because you know how little pasta you actually ate. I tried to cut all my pasta fillings into roughly equal shapes so that they all cook in about the same amount of time (and it looks pretty). I also used an olive oil spray to coat the pan with minimal added fat. To start, cook the onion and the mushrooms with garlic salt. Cut the sausage into small cubes so that you can get bites of spice throughout the dish rather than only sporadically. Most chicken sausage is already cooked, so you just need it to heat through and brown. And then with the bell pepper I like the crunch so i added that just at the end. Again, you can definitely adjust the fillings based on what you have in your fridge! I like to have a balance of textures and flavors to make the dish feel more complete. Sorry! Forgot to take a picture of the full amount of sauce before adding it to the pasta! Blend garlic, lemon juice, and olive oil until smooth. Add avocado, basil leaves, vegetable broth and cheese and puree until creamy. Season to taste. If you are tasting too much lemon, add more vegetable broth. If you can’t taste the avocado, add a bit more cheese (or salt). The original recipe called for a full avocado, but I only had a half on hand and didn’t feel deprived of the creaminess or flavor of avocado. If you have a full avocado, cut down the amount of vegetable broth. Finally, cook the pasta. Soba noodles cook in about 4 minutes, so I waited until everything else was ready before cooking them. 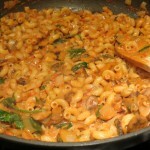 If you are using pasta that needs more time, start the pasta as soon as the water boils. The next step is simple– combine! This bowl is almost overflowing and there is only 1/2 serving of soba noodles in it! The sauce is a really pretty green color but subtle in flavor. This was a really wonderful healthy indulgence and I was really happy with the results. I hope you try this dish next time you have 1/2 an avocado you don’t know what to do with!